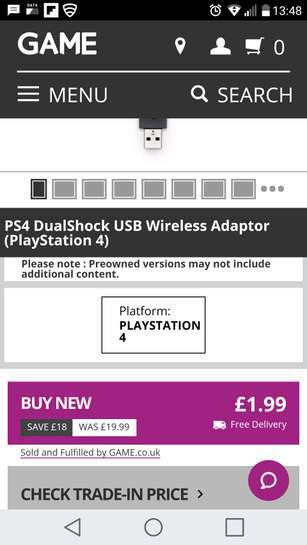 It seems like all of the official sellers(on PlayStation's website) are out of stock and the only ones who have stock are selling it at £45+ which is a joke since at some point it was on sale for £10/£15. Is there something that I should be aware of? Try Game in store. Showing as £1.99 online but can't add to basket. I was under the impression that any half decent Bluetooth dongle would work. Sorry for my ignorance. But What would you need that for? I've got Macbook pro and I can't use the Dualshock 4 to remote play my PS4 it's just not recognized although it connects via Bluetooth. That device is an official dongle from PS so you can fully use the Dualshock 4 including plugging headphones/mic to it.